Oregon state Representative Brian Boquist, R-Dallas, evidently had joined the long list of House Republicans who were quitting the legislature at the end of this term. As he told the Oregonian back in June, "The Democrats came in with an agenda, and they left with the agenda complete. . . . You get to the point of, is it worth it?" The Oregonian's Jeff Mapes is reporting on his blog that Boquist now has turned a 180 and then some: He's still not running for the House, but he is running for the Senate, for the seat held by third-term Senator Gary George, R-Newberg. George had been widely rumored as likely to depart after this term; apparently the succession has been worked out. Mapes adds that "Boquist may be able to slide into the Senate seat." That's certainly possible. Of the two House districts in Senate District 12, Boquist's is probably the more solidly Republican (perhaps the most rural of Willamette districts, it runs south to within 20 miles or so of Eugene), and he has won his two terms there decisively. (The other House seat is held by Donna Nelson, R-McMinnville, who nearly lost last year, and may also retire in 2008.) He's a solidly experienced campaigner at this point, after not just those experiences but also two (failed) runs for Congress against Democrat Darlene Hooley. And he has a compelling personal background, including a career in the military with time in special forces and assignment not so long ago in Iraq. He clearly enters the race as the man to beat. That Nelson race and some other indicators, though, suggest that the district may be less solidly Republican than it traditionally has been. The next move here is up to the Democrats, who have a tougher challenge trying to take this seat than would have been the case if George had left without a successor ready to step in. Legislators in Washington and Oregon have been dropping off almost too fast to post on each one, but some of the carry larger implications. Let's take a moment to consider politics in the wake of Washington Representative Chris Strow, R-Freeland. Strow is leaving to go to work as principal economic policy analyst with the Puget Sound Regional Council. He has been an assistant Republican floor leader. Our interest here is in the future of his House seat. 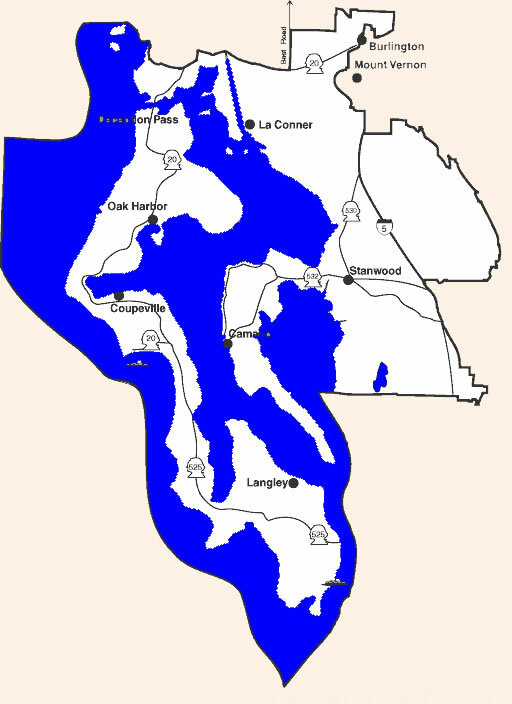 He serves in District 10, which is anchored by Whidbey Island and includes chunks of Puget Sound-facing Skagit and Snohomish counties. This has mostly been assumed to be Republican territory. The large military presence on Whidbey has made Island County generally more Republican than most of what surrounds it, and Skagit often has a Republican tilt. And Strow was re-elected unopposed last year. Dig a little deeper and you find more of interest: When legislative seats here are contested by both parties, the results are often quite close. When Strow ran in 2004, he won with just 50.1% of the vote over Democrat Nancy Conard (47.1%). The other representative here, Republican Barbara Bailey, took just 51.5% in 2006 over Democrat Tim Knue. In 2004, she won with a stronger 58%, but her take in 2002 was 51.5%. And the senator here is a Democrat, Mary Margaret Haugen, who also last won (in 2004) in a tight race, taking 50.3% over Republican April Lynne Axthelm (47.1%). Looks like this district may go on the short watch list for '08. The LaRocco campaign suggests comparing it with a fundraising letter former Governor Cecil Andrus wrote for LaRocco, and the difference is considerable. But we were more struck by a simple reading of the letter itself. 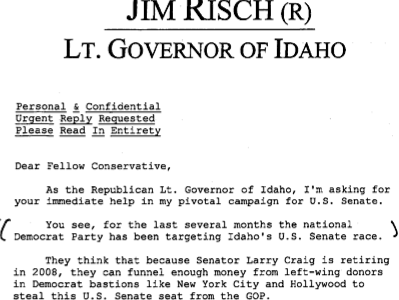 Leaving aside that it didn't capture Risch's personal voice - he's more crisply articulate than the letter's text, for example - the message in it is stark, and a little startling.